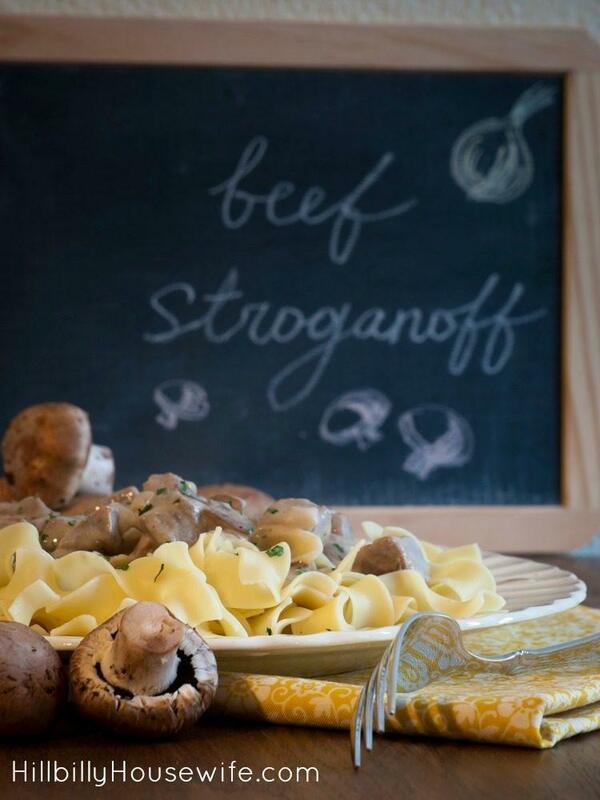 Creamy beef stroganoff is always a favorite around here. This recipe is made with ground beef, making it a frugal dinner option. You don’t need a whole lot of meat since the mushrooms and noodles make up the bulk of the meal. It’s one of those meals you can throw together quickly. You can safe even more time by browning your ground beef ahead of time. Just head it up and proceed with the rest of the recipe. By the time the noodles are done boiling the stroganoff is ready too. Fry up your meat in a large skillet. Drain off any fat if necessary. Break the meat up into small bits as you cook it. Add the onion, garlic and mushrooms. Saute all together until the onions and mushrooms are tender. Add the water, beef bouillon, and pepper. Bring to a boil over medium head. Meanwhile, combine the white flour and 1/2-cup cold water in a small jar with a good lid. Screw the lid on and shake the mixture until the flour is dissolved into the water. Pour this slurry into the boiling mixture on the stove. Simmer for a few minutes to thicken. Remove the skillet from the heat and allow it to sit until all boiling stops. Stir in the yogurt or sour cream. Mix well. Serve over egg noodles. This recipe makes about 5 servings. Add broccoli and carrots on the side and serve fruit for dessert.